A Vineland man was convicted Friday in three armed robberies of banks in 2014. Stephan Byrd, 44, robbed three banks of more than $22,000 in a 6½-week span, according to the charges. A jury deliberated six hours before finding him guilty off all three along with two counts of brandishing a firearm in furtherance of a bank robbery, one count of using and discharging a firearm in furtherance of a bank robbery and a count of being a felon in possession of a firearm. The spree began June 7, 2014, at the Ocean City Home Bank in Mays Landing, according to the state’s case. Byrd pointed a gun at a bank employees and warned them not to push the panic alarm. He stole $5,576 and fled through the nearby woods. He and Charles Sanders went into the Newfield National Bank in Vineland on July 19, 2014, both armed with guns and covered up from head to toe, according to evidence presented at trial. Sanders stayed in the lobby while Byrd vaulted over the bank counters, pointing his gun at employees. He stole $10,297 from the bank drawers and fled into the woods with Sanders, who previously pleaded guilty. That money contained dye packs, which exploded during their escape. On July 21, 2014, Byrd entered the Newfield National Bank in Malaga, Gloucester County, again covered head to toe, the state said. He again went over the counters to gain access to the drawers. But after he ran off with $6,139, a bank customer followed, trying to get information to help identify him. Byrd pointed the gun at the customer and fired. The customer was not hit. 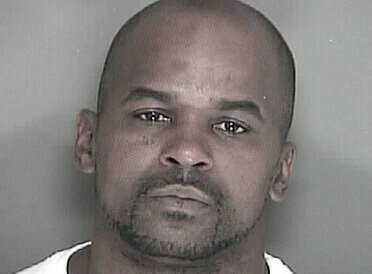 Byrd faces 24 years to life when he is sentenced July 18.